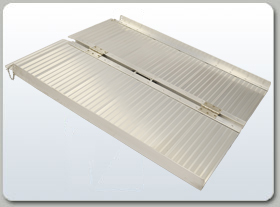 Introducing the B-Dawg® Folding Ramp. 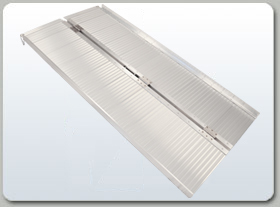 Our wheelchair ramp line offers high quality, folding portable ramps at affordable prices. These ramps fold to half their width and can be deployed in seconds. 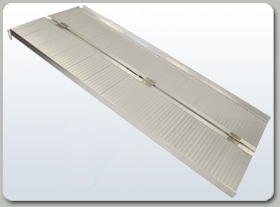 We offer ramps in 2, 3, 4, 5, and 6 ft. long models. The B-Dawg 2 ft. Folding Ramp folds to half its width and can be deployed in seconds. The built in non-skid surface will not wear off, and an all aluminum construction keeps the ramp lightweight, yet heavy duty. This ramp is perfect for loading manual or power wheelchairs, scooters, and other wheeled devices over curbs or a single step. 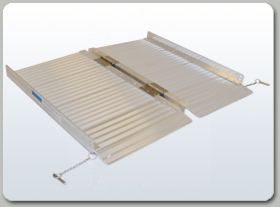 Folded Size (L x W x H): 25" x 16" x 4"
The B-Dawg 3 ft. Folding Ramp folds to half its width and can be deployed in seconds. The built in non-skid surface will not wear off, and an all aluminum construction keeps the ramp lightweight, yet heavy duty. This 3 ft. ramp includes a carrying handle so that it can be easily carried like a suitcase. This ramp is perfect for loading manual or power wheelchairs, scooters, and other wheeled devices over curbs or a single step. Folded Size (L x W x H): 38" x 16" x 4"
The B-Dawg 4 ft. Folding Ramp folds to half its width and can be deployed in seconds. The built in non-skid surface will not wear off, and an all aluminum construction keeps the ramp lightweight, yet heavy duty. This 4 ft. ramp includes a carrying handle so that it can be easily carried like a suitcase. This ramp is perfect for loading manual or power wheelchairs, scooters, and other wheeled devices over curbs or 1-2 steps. Folded Size (L x W x H): 49" x 16" x 4"
The B-Dawg 5 ft. Folding Ramp folds to half its width and can be deployed in seconds. The built in non-skid surface will not wear off, and an all aluminum construction keeps the ramp lightweight, yet heavy duty. This 5 ft. ramp includes a carrying handle so that it can be easily carried like a suitcase. This ramp is perfect for loading manual or power wheelchairs, scooters, and other wheeled devices over curbs, 1-2 steps, and even into certain minivans. Folded Size (L x W x H): 61" x 16" x 4"
The B-Dawg 6 ft. Folding Ramp folds to half its width and can be deployed in seconds. 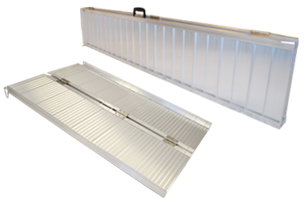 The built in non-skid surface will not wear off, and an all aluminum construction keeps the ramp lightweight, yet heavy duty. This 6 ft. ramp includes a carrying handle so that it can be easily carried like a suitcase. This ramp is perfect for loading manual or power wheelchairs, scooters, and other wheeled devices over curbs, 1-2 steps, and even into certain minivans. Folded Size (L x W x H): 73" x 16" x 4"